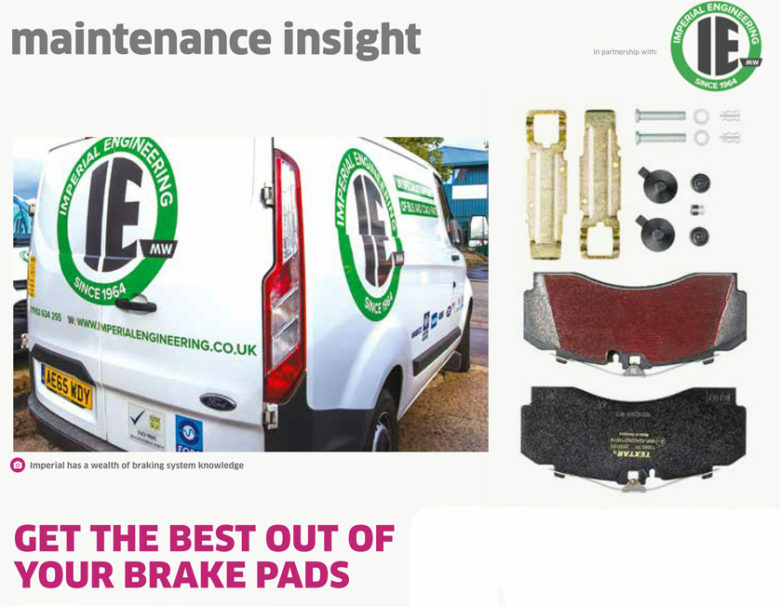 According to Imperial Engineering, selecting vehicle-specific OEM brake pads can provide PSV operators with a major advantage when it comes to ensuring maximum service and optimum braking performance. Leading friction manufacturer TMD Friction produces OE brake pads under the Textar brand for global OEMs such as Knorr-Bremse and Wabco. OEM quality brake pads are designed for specific vehicles to deliver the braking performance of a bus when it first enters service, both in terms of stopping ability and wear levels and to ensure they provide their intended service life. Using cheaper generic alternatives can often prove to be a false economy, as this can result in the brake pads wearing out more quickly than anticipated. This in turn leads to unnecessary vehicle downtime and high component replacement costs. In addition, brake output at the wheel can also only be assured if the brake pads feature the correct grade of friction material specified by the vehicle manufacturer. This safety-critical factor is particularly important for buses equipped with Electronic Braking Systems (EBS), where OEM-specified brake pads are required to ensure correct braking performance is maintained and the required stopping distances are achieved. These sophisticated systems are controlled by Electronic Control Units (ECUs) which are individually programmed to provide the braking system with the data required to ensure optimal performance. If a bus is fitted with the incorrect brake pads with non vehicle-specific friction material, the braking system is unlikely to perform as the EBS expects it to, resulting in the system attempting to compensate by increasing or decreasing braking pressures. This can result in a ‘Catch 22’ situation where the overall braking performance, safety and stability of the vehicle can deteriorate, causing the EBS to compensate even further by making more alterations to the braking pressures, leading to excessive and ultimately costly wear to both the brake pads and the brake discs. The simple route to avoiding this problem and maximising service life is to ensure that vehicle-specific OEM quality brake pads with the correct grade of friction material used. This will ensure performance, reliability and predictability, as well as minimal whole-life costs.